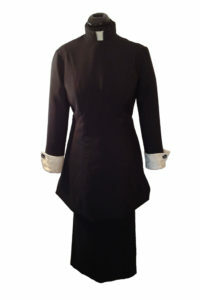 Designer Women's Clergy Suit. Suit has an elastic waist skirt and a three quarter length top with a back zipper. Available in Black, White, Cream, Navy, Royal Blue, Red and Purple.